Akaushi steaks are for dinner tonight. Akaushi are the prized ‘Red Cattle’ from Kumanoto, Japan. These cattle were bred to withstand the challenging climate and terrain of Kumanoto. We have found these steaks at the Golden Gate Wine Country Meats, Inc. Ms. Goofy and I were on a meat adventure to visit our good friend Angelo from Angelo’s Meats. 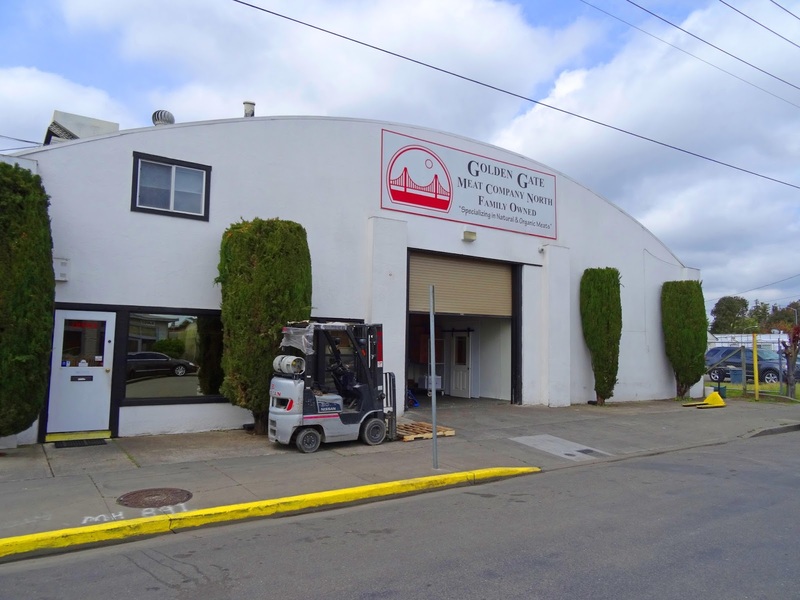 Angelo mentioned that he had tried the Akaushi beef from Golden Gate Wine Country Meats Inc. Golden Gate runs a wholesale meat company that specializes in high end beef for restaurants and other meat markets. It also happened to be located near our lunch stop. 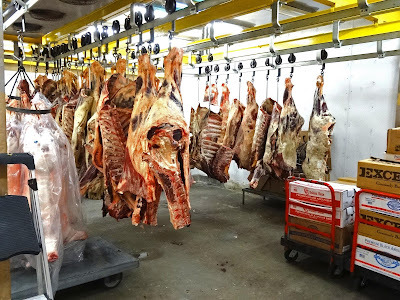 We went to lunch and afterwards poked our head in the doors to Golden Gate Meat Company. The meat buying public goes into a small office to place any orders. I inquired about buying several of the Akaushi steaks. Jamie Lloyd, manager told me that the smallest order would be $ 150 dollars. I was a little skeptical with this price tag because I was unfamiliar with this beef. Jamie and I talked about the quality of this beef. These cattle are raised in Texas by Heart Brand Beef Company. The herd originated from true Red Cattle imported from Japan. Heart Brand Beef Co. has a brochure touting the healthy aspects of this particular breed. According to Heart Brand Beef: The beef has “unique composition and ratio of healthy fats helps to lower cholesterol and support weight loss. “. I am not sure what to make of this claim and think of P. T. Barnum’s classic quote; There is a sucker born every minute. I asked Jamie if I could see the beef. I also asked if I could come into the meat processing area and take some photos. Jamie asked the boss and I was informed I would have to wear a yellow smock and a mesh hair bonnet. I was allowed into the inner sanctum of Golden Gate Wine Country Meats. 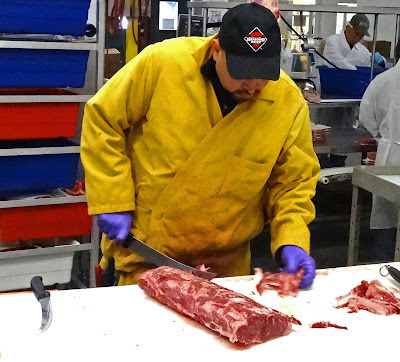 We walked past several workers cutting and wrapping various cuts of meats. We then went into a walk-in and saw rows of boxed meat. I was showed the whole New York Strip steak and it looked fantastic. I was sold on the marbling. We then returned to the cutting area where I got to witness the cutting and trimming of the whole primal cut. I asked him to cut them into 2 inch thick steaks. They then wrapped them for me as requested. It was a lot of fun being able to go behind the scenes and witness this process. Everybody seemed to really enjoy their butchering duties and extended every courtesy to this Mad Meat Genius. I also walked out of the door grinning with a whole box of steaks. We could not wait to get home and cook one of these good looking steaks. A high heat grilling on the bbq with salt & pepper as the only seasoning would cook this beauty. This was one fine steak. It had all the right moves. It was very tender with big beef flavor. This also had a lusciousness in each and every bite. This is a high end steak that needs to be appreciated. According to Heart Brand Beef this steak is good for you too. 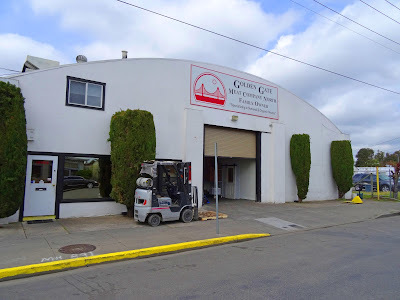 We would like to thank Jamie Lloyd of Golden Gate Wine Country Meats for the tour and the over the top fantastic service. Big Dude, It seems like we are on a roll these days. 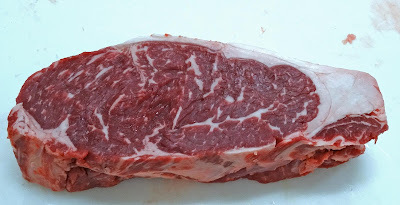 Ms. Goofy also gifted me a birthday gift certificate for Snake River Farms for some American Wagyu. We are having fun. 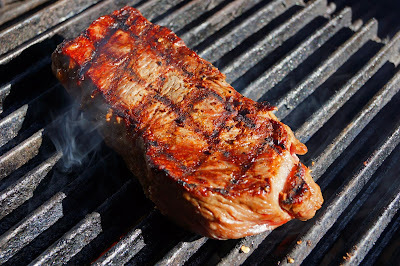 I would like to personally congratulate you as your blog CHILEBROWN MADMEATGENIUS has been selected by our panelist as one of the Top 50 Meat Blogs on the web. 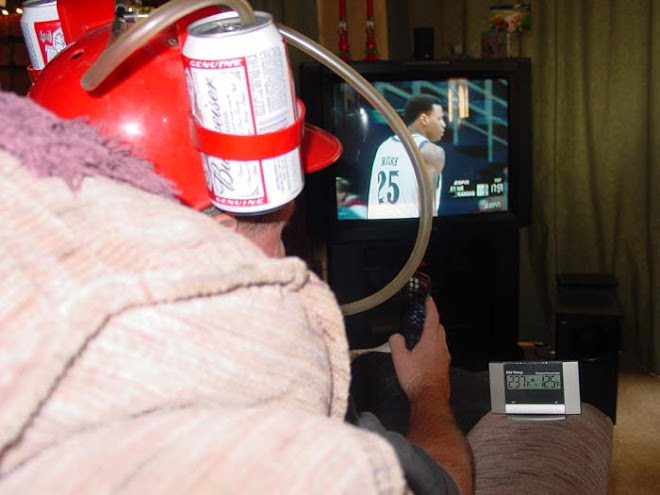 I personally give you a high-five and want to thank you for your contribution to this world. This is the most comprehensive list of Top 50 Meat Blogs on the internet and I’m honored to have you as part of this! Mr Brown congratulations on your new honor. 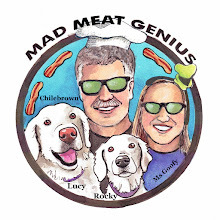 I would like to personally congratulate you as your blog MAD MEAT GENIUS has been selected by our panelist as one of the Top 100 Barbecue Blogs on the web.